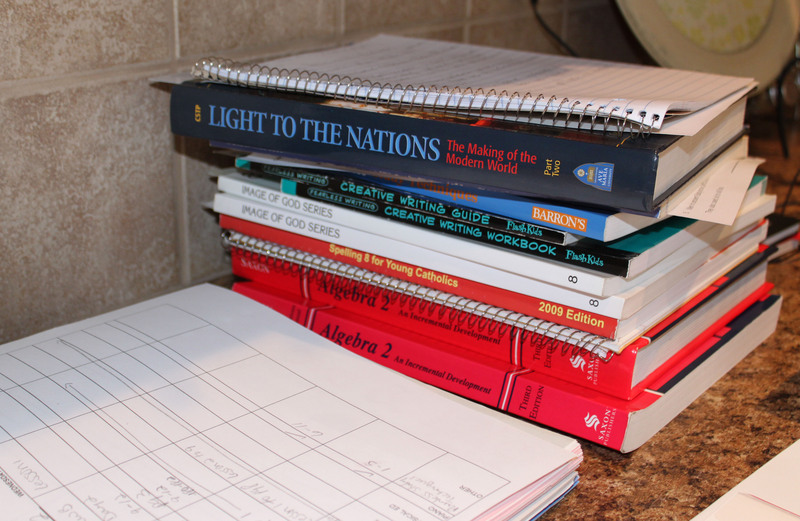 For those of you that do not know…I am a homeschooling Mom. I have always homeschooled my boys. Someday I might tell the whole story of how we started, but for now, just know that it was never something I thought I would do. However, it has been such a blessing to our family. We finished our year in April and so, after 3+ months it was time to start again. It is always hard to begin. The big stack of books is always intimidating, no one wants to leave the lazy days of summer. Wait, this summer was not lazy. It was busy and crazy, and it went, oh so fast. Still didn’t want to leave those days though. Yesterday was our first day. It went quite well even though both boys have colds. The above photo is a stack of books that my 13-year-old will be using this year for 8th grade. The sad part is that isn’t all of the books. He has a few more things including Physical Science and an online Spanish class that will be starting soon. My 16-year-old will have a lighter year at home, and for the first time will take a class at the local high school. He chose Physics at CHS, as well as an Engineering Robotics class at the Career Academy. That starts later this month. The good news is that we now have 2 days done, only 173 more to go. Ha. The bad news is that means I will have a lot less time to thrift and junk, as well as work on my Etsy Shop. It is an adjustment, but it is all good. I am not going anywhere, just adjusting my schedule. So what are you doing during the last days of summer?